Every so often when engaged in discussion on the subject of the prosperity gospel, I hear voices sympathetic to this doctrinal poison say, “But surely God does not want us to be poor, does he?” This is viewed as a trump card, as if there is no middle ground between being stinking rich and being in abject poverty. The Bible has many texts that answer that question. People who say such things suffer from deliberate amnesia. They choose to forget the words of the wise man who prayed to God, saying, “Two things I ask of you; deny them not to me before I die: Remove far from me falsehood and lying; give me neither poverty nor riches; feed me with the food that is needful for me, lest I be full and deny you and say, ‘Who is the LORD?’ or lest I be poor and steal and profane the name of my God” (Proverbs 30:7-9). If you survey the Bible you will not find a single verse that warns you against the detrimental spiritual effect of material poverty. Yet you will find many passages in the Bible warning you against the detrimental effects of wealth—and especially love for wealth. You never hear prosperity preachers preaching on such verses. It is as if their Bibles do not have such verses. Here are a few from the lips of our Saviour. In his famous Sermon on the Mount, Jesus taught, “Do not lay up for yourselves treasures on earth, where moth and rust destroy and where thieves break in and steal, but lay up for yourselves treasures in heaven, where neither moth nor rust destroys and where thieves do not break in and steal. For where your treasure is, there your heart will be also...No one can serve two masters, for either he will hate the one and love the other, or he will be devoted to the one and despise the other. 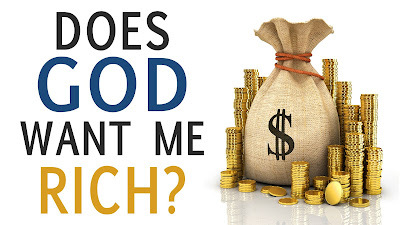 You cannot serve God and money” (Matthew 6:19-24). Then the Lord Jesus in Mark 10:17–25 dealt with a rich young ruler who wanted eternal life as long as he was not asked to sacrifice his great wealth. When Jesus told him to sell all that he had and give it to the poor so that he would have treasure in heaven, the Bible tells us that the saying disheartened him. He went away sorrowful, for he had great possessions. Jesus went on to make the unequivocal statement, “How difficult it will be for those who have wealth to enter the kingdom of God...! It is easier for a camel to go through the eye of a needle than for a rich person to enter the kingdom of God.” I repeat; you never hear these words from the lips of prosperity gospel preachers. Rather, they give the impression that being materially wealthy is the sure sign that all is well between your soul and God. One more example from the ministry of Christ should suffice. On one occasion, someone in the crowd said to Jesus, “Teacher, tell my brother to divide the inheritance with me.” Jesus refused. This should surprise not only prosperity gospel preachers but also advocates of the social gospel. Instead, Jesus warned the person asking for this favour from him. He said, “Take care, and be on your guard against all covetousness, for one’s life does not consist in the abundance of his possessions” (Luke 12:13–15). Material wealth is not blessedness. “The land of a rich man produced plentifully, and he thought to himself, ‘What shall I do, for I have nowhere to store my crops?’ And he said, ‘I will do this: I will tear down my barns and build larger ones, and there I will store all my grain and my goods. And I will say to my soul, “Soul, you have ample goods laid up for many years; relax, eat, drink, be merry.”’ But God said to him, ‘Fool! This night your soul is required of you, and the things you have prepared, whose will they be?’ So is the one who lays up treasure for himself and is not rich toward God” (Luke 12:16–21). Jesus seems to have been saying that the accumulation of wealth can often be due to many lost opportunities to invest into the kingdom of God. So, it is poverty! What about the apostles? What do they say about financial prosperity? A good example is the apostle Paul. Writing to Timothy, his protégé, he talks about “people who are depraved in mind and deprived of the truth, [who imagine] that godliness is a means of gain” (1 Timothy 6:5). I cannot think of a better description of prosperity gospel preachers. They are people of depraved minds and deprived of truth, who view godliness as a means to only one thing—to become wealthy. They are not interested in the salvation of souls and so have lost the content of the true gospel long ago. All they want is money. But, I digress…. We are looking at Paul’s warnings. He stands where the wise man in Proverbs 30 stood, advocating a middle financial position as the best place to be. He says, “But godliness with contentment is great gain, for we brought nothing into the world, and we cannot take anything out of the world. But if we have food and clothing, with these we will be content” (6:6–8). This is the answer I keep giving those who think that by opposing prosperity gospel preachers I am inadvertently advocating for poverty. Why go from one extreme to another? It is very clear that the apostle Paul warns against an insatiable thirst for wealth. He says, “But those who desire to be rich fall into temptation, into a snare, into many senseless and harmful desires that plunge people into ruin and destruction. For the love of money is a root of all kinds of evils. It is through this craving that some have wandered away from the faith and pierced themselves with many pangs. But as for you, O man of God, flee these things” (6:9–11). Prosperity preachers need to heed such warnings and preach them to their hearers. It has been a failure to heed such godly counsel that has made many of their followers to pursue wealth at great cost to their spiritual lives, their marriages, and their families. Judging from the silence on these passages of Scripture in the pulpits of prosperity preachers, I have no doubt that they wish such verses did not exist in the Bible because they fly in the face of their teachings. Prosperity preachers swallow entire camels and strain gnats. They go to those verses that talk about holistic prosperity (i.e. general success, to use a more modern equivalent) and torture them until they apparently start talking about material prosperity only. Do not get me wrong. We should praise God for those in our midst whom God has favoured with good jobs and businesses, which have resulted in wealthy bank accounts. Some of them have had a fat inheritance. We need to pray for them that God will give them godly wisdom in utilising their wealth for the eternal benefit of their souls and the souls of others. However, let us not envy them because with riches come many sorrows. Let us rather pray that God will give us neither poverty nor riches. It is a less hazardous load to carry in this fallen world. "If you survey the Bible you will not find a single verse that warns you against the detrimental spiritual effect of material poverty." Actually, there is one (only one, I think) -- and it is the one you cited, Prov 30:9b! Otherwise, poverty in scripture is an outcome of sinful folly, not the condition giving rise to it, which is the case for wealth. What I like about this man is, he is a firm believer of the BIBLE -NO MORE NO LESS. Calm physical preacher he is. Although I tend to disagree, these spiritual hubbies do exist, not only have I heard about them, but experienced. If they are not spiritual, then what are they??? I have a lot of respect for you and your crusade against this charismatic movement, which has lost many people with its Africanisation and desire for wealth. And it is justified. Something has gone wrong with this kind of 'christianity'. But where I think both pro- and contra-wealth preachers miss it is that wealth, in principle, is a relative term. Most of the 'rich' Zambians (can afford a car, a house and three square meals, send kids to expensive schools) would actually be poor in another setting. In short it is not about having a lot of stuff that the Bible is warning about. It is our relationship with stuff WHETHER WE HAVE ANY OR NOT. There are poor people killing for K10 in villages. So to say that with "riches come many sorrows" is also short-sighted and contradictory to scripture. That too is dangerous. Paul's admonition to Timothy is that those WHO CHASE RICHES will come to many sorrows. That is not the same thing as your statement. Those people may be poor or rich. There are sorrowful people in nicely roofed homes just as there are in poorly roofed ones. Similarly there are happy people in Kanyama as there are in Kabulonga. It is because of these confusing statements that the church body is left confused by preachers who are in ditches on both sides of the road on on this particular matter. Dear Bro. Conrad, such a great article I have reposted it on our website and FB. A few years ago when I was Chaplain at a local jail we had a very appealing and well verses man who was all about this theology. I finally countered it with a sermon Entitled "Yes God does want everyone to prosper" based on Joshua 1:8. Of course it had nothing to do with their type of theology just that written in God's Holy Word. I appreciate this article, but I have to be a little nitpicky, as there is a biblical passage which talks about a negative spiritual consequence of poverty (and also riches). It is Proverbs 30:7-9. Nevertheless, the general biblical atmosphere is against the love of money, as you say. God bless you.